This module generates 'white' and 'red' and 'blue' noise. Starting with a transistor 'avalanche' junction noise generator the versatile 9751 may be reconfigured to use an optional Zener-diode for noise generation. 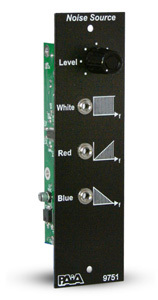 A level control is provided for noise volume adjustment or for matching the 9751 output to the control voltage input of another module such as our 9752 Sample and Hold. Outputs from the module include full-spectrum 'white' noise, plus, filtered sources for 'red' ('pink') and 'blue' noise, saving the effort of patching through an external filter module to obtain non-full-spectrum noise. To purchase the full assembled kit, view the 9751ASM product page.